The sights and sounds of the holidays are all around us. It started before our Halloween candy had even been devoured. Turkeys, trees, candles, and lights have popped up everywhere you look and will be with us through the start of the New Year. It can very be easy to get caught up in the whirl, wonder and pressures of the holiday season. It’s easy to understand why. The season rushes in, the calendar fills up with family gatherings and social events, and expectations begin to override intentionality. We can, at turns, be filled with joy at the bounty that surrounds us, overrun with stress because of all that we have to do, and engulfed by sadness as we miss a loved one who’s now gone. While planning a perfect feast, bracing for any complicated family dynamics or looking ahead to some epic shopping adventure, we may miss an important opportunity to take a break to simply appreciate what we have. There’s a risk of all the love and abundance already in our lives getting overlooked—passed over like tofu turkey. Finding time to be grateful for the good things in our lives can be a critical game changer for us this season and beyond. Research has found that by cultivating appreciation and gratitude as a daily routine, we can make the holiday—and our lives in general—decisively happier. Believe it or not, the actual act of being grateful has lasting rewards. These benefits are physical and emotional and can be experienced by people of all ages. What are some of the particularly great things about gratefulness? People who practice gratitude, on average, have lower blood pressure, a lower risk of depression and anxiety, and a unique power to heal, energize and change lives. Taking on an attitude of gratitude can decrease pain and improve sleep, promote healthier relationships and improve all-around wellbeing. Active gratefulness also prompts people to strive to make progress toward their goals. Indeed, giving thanks deserves to be given a try. Now, how can you weave gratitude into your life? Take a moment to write down something you’re grateful for in a journal each day: a special pet, a friend’s kind words, warm sunlight, a child’s smile, your favorite team’s winning record—anything you value. 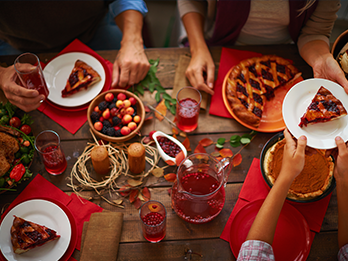 Share gratitude around the dinner table with your family, asking each member to express appreciation for one thing that happened that day. Thank the people who serve you from the grocery store or gas station to the boardroom. Look at past challenges and remind yourself what good lessons you learned from them. Celebrate accomplishments with your co-workers at the beginning of a meeting before moving on to new business. All of these are readily available ways to put more thanks in the tank. This season, however you may enjoy all of its tasty fixings and modern fixations, be sure to also fix your mind on gratefulness. The simple practice of appreciation points us to a better life. Why not make it a habit starting today? If you need help coping with the stress of the holiday season or exploring ways to find all that you have to be grateful for, Centerstone is here to help. Beth Hail is Regional Vice President for Centerstone, serving its central Tennessee region. She holds a master’s degree in social work administration and is a licensed clinical social worker.